Selecting exercises for pre and post hip replacement must take into account where the surgical incision will be which means there is no one exercise program that can be designed for all hip replacement clients. There are three main types of hip replacement incisions a patient may receive and they include: the medial incision, posterior incision, and the anterior incision. If you are waiting for a hip replacement and engaging in exercises pre operation, the important question to know and ask your surgeon is where will the incision be? If you are post hip replacement surgery and participating in an exercise program make sure your physiotherapist or personal trainer knows where your incision is so they can develop an exercise program to focus appropriately on rebuilding the muscles which have been affected most. If you are a patient or training a client with an anterior incision surgical approach for hip replacement, then the main muscle you want to target strengthening is the hip flexors. Exercises for this muscle include seated hip flexion repetitions, standing hip flexion exercises, and prone mountain climbers depending on core and overall strength ability. Of course your focus would be on including at least two strength exercises for the hip flexor, but your overall strength program will still include all the hip stability muscles including the gluteals, quadriceps, hamstrings, and deep abdominals. The medial incision for hip replacement is completed at the side of the hip and cuts right through the gluteus medius. Therefore, the strength program for a medial hip replacement incision both pre and post operation must focus on this muscle and the best exercises for it are the clam shell and side leg raise. Those are the safest exercises that can be done by most people and are non weight bearing. There are functional weight bearing exercises that you can do to strengthen this muscle but pain is a factor pre surgery, and the time frame post surgery must be taken into account when giving full weight bearing, functional exercises post operation. Similar to the medial incision, the posterior incision for hip replacement cuts through the gluteus maximus muscle and therefore will require specific exercises to strengthen it pre and post operation. 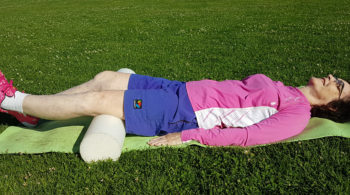 Selecting two to three exercises that ensure a strong contraction of the glutes along with functional movement is essential to recovering strong post hip replacement. A few great exercises for this muscle group are bridging, hip extension, seated gluteal contractions, and squats. Although this is the main muscle that is damaged, again you will need to build up the surrounding core hip stability muscles that includes the gluteus medius. The reason it is so important to know where your incision will be and communicate this to the person creating your exercise program is that their are safety precautions and limitations on exercises dependent on the incision site. 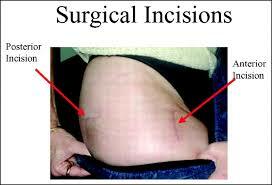 Take for example someone who has had an anterior incision hip replacement surgery. 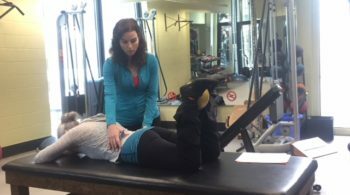 They are restricted or banned from doing hip extension exercises like the bridge for a specific amount of time post surgery. In addition, they are educated to avoid external rotation of the hip which would include an exercise like the clam shell. If people do not adhere to these restrictions and guidelines, they run the risk of having a hip dislocation. On the reverse side, if a patient has had a posterior hip replacement incision, they are warned and advised to avoid any or excessive hip flexion past a specific range of motion, generally 90 degrees. Again the reason for this is it puts them at risk of dislocation. These limitations are usually set to a specified time by their surgeon or physiotherapist and the minimum amount of time is usually 2-3 months. 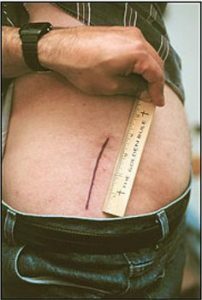 The medial incision hip replacement client is advised to avoid internal (seen on the left here) and external rotation of the hip as well as excessive hip flexion past the 90 degree hip range. The clam shell and hip extension exercises are excellent for these clients and hip flexion strength exercises usually are not required. Not all Exercises, Restrictions, and Precautions are the same for Hip Replacement Patients! The Incision Site determines the Exercises for Hip Replacement Clients. This post came about due to some questions that were raised around exercises being correct or safe. It is really important to know the differences between hip incisions and how it impacts exercise selection and safety for yourself if you are a hip replacement patient or training hip replacement clients. You can learn more with the Hip Replacement Exercise Program Here or in our Joint Replacement Course for Personal Trainers here.